Let’s Play Whack-A-Muslim-Brotherhood-Mole! — 1389 Blog - Counterjihad! If you’ve been around video or pinball arcades, no doubt you’ve encountered Whac-A-Mole. If you haven’t, you can play it online for free at Addicting Games. Whac-A-Mole is an arcade redemption game. 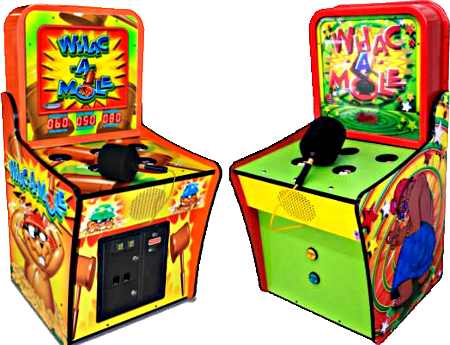 A typical Whac-A-Mole machine consists of a large, waist-level cabinet with five holes in its top and a large, soft, black mallet. Each hole contains a single plastic mole and the machinery necessary to move it up and down. Once the game starts, the moles will begin to pop up from their holes at random. The object of the game is to force the individual moles back into their holes by hitting them directly on the head with the mallet, thereby adding to the player’s score. The more quickly this is done the higher the final score will be. We in the blogosphere can help by uncovering at least some of the Muslim Brotherhood bad guys (and some bad women, of course), so that we don’t have to wait for them to rear up their ugly heads on their own. We’ve recently drawn your attention to that wolf-in-sheep’s-clothing, Grover Norquist, who has insinuated himself into conservative and Republican circles as an anti-tax activist, but who is a vile agent of the Muslim Brotherhood. How did CPAC come to this? It was Norquist who ushered these silver-tongued jihadists into the Oval Office of an incurious president after the worst attack ever on American soil. Instead of Hamas, Hezb’allah, and the Muslim Brotherhood, Ibn Warraq, Bat Ye’or, and Wafa Sultan should have been advising the president. Instead, at that September 26 meeting, Bush declared that “the teachings of Islam are teachings of peace and good.” It was a critically important, historic incident. What should have been the most important teaching moment of the long war became a propaganda tool for Islam. A singular opportunity was squandered, and the resulting harm is incalculable. …has formed alliances with prominent Islamic radicals who have ties to the Saudis and to Libya and to Palestine Islamic Jihad, and who are now under indictment by U.S. authorities. Equally troubling is that the arrests of these individuals and their exposure as agents of terrorism have not resulted in noticeable second thoughts on Grover’s part or any meaningful effort to dissociate himself from his unsavory friends. Horowitz wrote this in an introduction to a detailed exposé by Frank Gaffney showing how Norquist had given Muslims with jihad terror links access to the highest levels of the U.S. government. Grover Norquist was on the Islamic payroll before and after the carnage of September 11. Gaffney revealed Norquist’s close ties to Abdurahman Alamoudi, who is now serving twenty-three years in prison for financing jihad activity. In 2000, Alamoudi said at a rally, “I have been labeled by the media in New York to be a supporter of Hamas. Anybody support Hamas here? … Hear that, Bill Clinton? We are all supporters of Hamas. I wished they added that I am also a supporter of Hezb’allah.” Alamoudi was at that time head of the now-defunct “moderate” group known as American Muslim Council (AMC), and he was active in other Muslim groups in the U.S. that showed sympathy to or support for jihadists. And Alamoudi, according to Gaffney, gave $50,000 to the lobbying group Janus-Merritt Strategies, which Norquist co-founded. 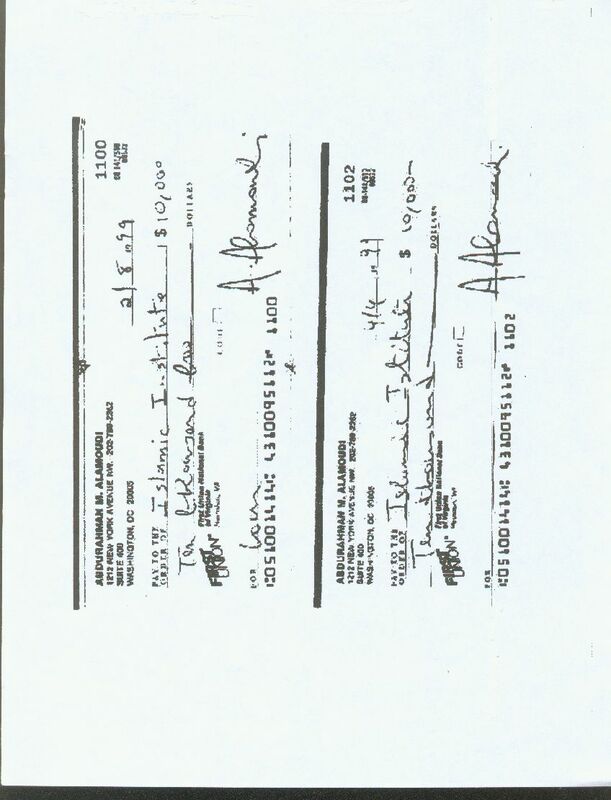 Alamoudi also helped found Norquist’s Islamic Institute with a $10,000 loan and a gift of another $10,000. The founding director of the Islamic Institute is Khaled Saffuri, a Palestinian Muslim who had previously been active in Islamic groups in Bosnia, where Islamic jihadists from all over the world gathered “to establish,” says Gaffney, “a beachhead on the continent of Europe.” Gaffney adds that Saffuri “has acknowledged personally supporting the families of suicide bombers — even though, in public settings, he strenuously denies having done so.” Saffuri also denounced Bush’s shutdown of the Holy Land Foundation, which was funneling charitable contributions to Hamas. Norquist has also carried water for Islamic supremacist attempts to weaken anti-terror efforts. Gaffney reveals that “Norquist was also a prime-mover behind efforts to secure one of the Islamists’ top pre-9/11 agenda items: the abolition of a section of the 1996 Anti-Terrorism and Effective Death Penalty Act that permits authorities to use what critics call ‘secret evidence.’ … Norquist was an honoree at an event held by Sami Al-Arian’s National Coalition to Protect Political Freedom in July 2001, two months before 9/11. The award was for being a ‘champion of the abolishment movement against secret evidence. '” Al-Arian in 2006 pleaded guilty “conspiracy to make or receive contributions of funds to or for the benefit of Palestinian Islamic Jihad.” Palestinian Islamic jihad is even worse than Hamas’s; it celebrates the killing of Israeli civilians and calls repeatedly for the destruction of Israel. We’ve already pulled the bedcovers (both figuratively and literally) off Hillary Clinton and her pet MB mole, Huma Abedin, in the context of Weinergate. Anthony Weiner resigned, but the real problem is his wife Huma, and she is still around! Even more disconcerting…is Secretary of State Hillary Clinton​’s aide and Deputy Chief of Staff Huma Abedin, who has been with Clinton since 1996. She was never properly screened, this will be proven beyond a shadow of a doubt. Abedin is even more potentially dangerous: She can leak state secrets. She is closely associated with her Muslim Brotherhood​ family and even joined Clinton at an event with her mother, Saleha Abedin, at Dar El-Hekma College in Saudi Arabia. Also present was a close associate of Saleha Abedin—Suheir Qureshi. Qureshi’s name later appeared in several prominent Arab newspapers when it was revealed that she belonged to a list of 63 members of the secret arm of the Muslim Brotherhood called The Sisterhood. The full list was later revealed—Huma Abedin’s mother is on it. Huma’s brother—Hassan Abedin—also collaborates with Omar Naseef and Sheikh Yusuf al-Qaradawi, two of the most influential terror supporters in the world. Other than Huma Abedin, has there ever been a case in which a family member who either belonged to the Muslim Brotherhood or was a prominent Islamist did not denounce a Muslim female relative who married a non-Muslim male? It’s a question with only one answer: Her family made an exception for her because Huma has a higher calling. Westerners erroneously compare the “Middle East” mindset with that of the “Midwest,” and fail to shift gears to understand the Muslim worldview. They do not comprehend the seriousness of a Muslim “daughter” or “sister” marrying a Jewish male, particularly because the Islamic Shariah Faculty in Kuwait has deemed Huma Abedin’s marriage to a male Jew null and void. While Westerners portray The Sisterhood as a simple “mule service,” our own detailed research—which will be released shortly—reveals male supervisors as official members along with their wives and/or daughters. The list includes spies who have proudly disclosed their heroic acts during Israel’s wars with Egypt. Others are Nazi-style propagandists, Nazi affiliates from the time of the Brotherhood’s inception, hijab (Muslim head covering and modest styles of dress) advocates in Europe, prominent doctors, popular conspiracy theorists and media icons that closely emulate the Goebbels propaganda machine of Nazi Germany. The group’s influence spans several international organizations from the United Nations to the United States to women’s advocacy groups worldwide. Its influence is immense. Overlooking this group—and by extension, Huma Abedin—is not dissimilar to ignoring the Able Danger intelligence operation’s revelations about Mohamed Atta​ prior to 9/11. Any doubting Thomas must acknowledge the validity of The Sisterhood list because it follows the same agenda and direction shown on the Muslim Brotherhood’s official website, and it has been confirmed by Egyptian security services and top experts, including the Arab Center for Research and Studies, headed by researcher Abdul Rahim Ali. To give you a taste of this bitter herb, we will examine a single name before we publish all 63. Take Najla Ali Mahmoud, who is supervised by her husband, Mohammed Aidalmrsi, member of the Muslim Brotherhood’s Guidance Bureau and the current leader of the Justice and Freedom Party (the Brotherhood’s new propaganda name). He recently appeared on national television and explained why “Egypt needs to ban Western dress” and how “no one with a full mental faculty can believe in the Trinity.” He even condemned Egyptian monuments as “idols.” This group differs from the Taliban only in that it has a Western propaganda machine. Will Egypt do to the Sphinx what the Taliban did to the Buddhist statues in Bamiyan, Afghanistan? Will Egypt perpetrate a holocaust on Coptic Christians who are already portrayed as having a mental deficiency for believing in the Trinity? And while this “Goebbels” runs his propaganda machine, the naysayers demand evidence of Huma Abedin’s membership in this notorious group. Would someone have appointed the daughter of Magda and Joseph Goebbels as the deputy chief of staff for Cordell Hull—the U.S. secretary of state during World War II​—arguing that she was not a member of the Nazi party? It is not “racist” to compare the Muslim Brotherhood with the Nazis. Hassan Al-Banna, the grandfather of Tariq Ramadan​(Ramadan’s ban from the U.S. was lifted by Clinton), collaborated with Hitler henchman Haj Amin al-Husseini, who became the Muslim Brotherhood leader after the war. Neither has the Brotherhood repented. They still take pride in their collaboration with the Nazis. This is a question the secretary of state should ask herself. MB moles in the Obama White House! Not that long ago, enemy foreign agents were rooted out and then hanged. Now we can’t even get them FIRED. Is that too much to ask? Former Muslim Amil Imani on Gov. Rick Perry’s ‘Muslim Connection’ — 1389 Blog – Counterjihad!